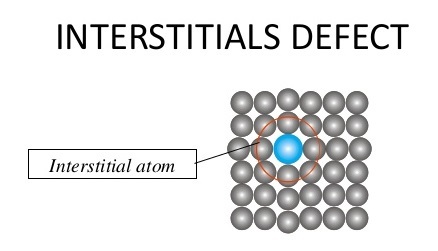 Whenever an extra atom occupies interstitial position [i.e., voids] in the crystal system without dislodging the parent atoms as shown in Fig. the defect caused is known as interstitial defects. This happens when the atomic packing factor is low. This atom which occupies the interstitial position is generally smaller than the parent atom. In close packed structures e.g. F.C.C and H.C.P, the largest size of an atom that can fit in the interstitial void or space have a radius about 22.5% of the radii of parent atoms. Interstitialcies may also be single interstitial, di-interstitials, and tri-interstitials.